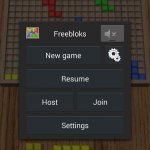 Freebloks 3D, the free implementation of the famous board game Blokus, now also exists in an Android version, which I created long after the original Freebloks 3D was released (available for Windows, MacOSX and Linux). The Android version is network compatible with the PC version and in fact shares most of the backend code, which makes it very easy to maintain compatibility between the two. 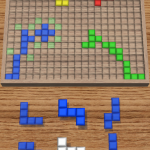 Like the PC version, Freebloks 3D for Android is free and open source Blokus implementation: the source code is available on GitHub, you can install the game from Google Play, Amazon App Store or F-Droid. The user interface is a complete rewrite, but the network and server code uses the original C++ code on Android, using jni. 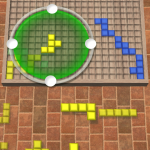 The game supports Blokus Classic with several 2 player variants, Blokus Duo and Blokus Junior. It supports multiplayer via Internet/WiFi or Bluetooth as well as on the same device (“Pass-And-Play”). Each player has 21 tiles: 12 tiles with 5 squares, 5 tiles with 4 squares, 2 tiles with 3 squares, 1 tile with 2 squares and 1 tile with 1 square. 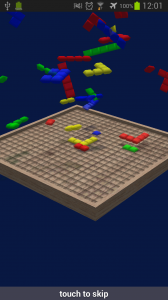 Players take turns in placing one tile onto the 20×20 board. 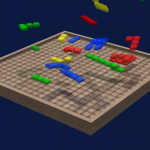 The first tile for each player has to be placed in their corner of the board. Each following tile has to touch a corner of one of your previous tiles, but it must never share an edge. It may share edges with the opponents’ tiles though. If a player has no more possible move, they have to pass. 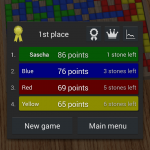 The game is over when no player can place a tile. For each player, the squares of all their tiles on the board are added up. Finishing a game with all stones placed on the board gives a 15 points bonus. If the monomino is placed last, you will get a 20 points bonus. The player with the most points wins. Swipe the list of available tiles with your finger. 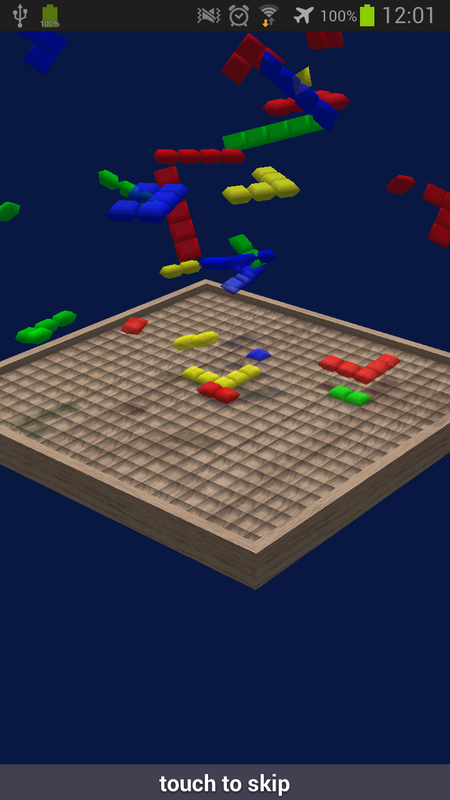 Select and drag a tile onto the board. Rotate the stone using one of the 4 handles. To flip a stone, slide your finger from one handle toward the opposing handle. Place the tile in the desired position. 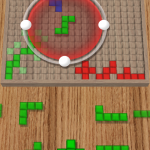 The tile will appear green if the position is valid, and red otherwise. Possible corners are highlighted on the board for convenience. Tap the tile in a valid position to place it. You can rotate the board at any time to see the opponents’ tiles. Quit the app at any time, your current game will be saved and restored on next start. 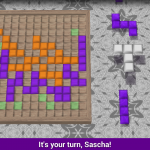 Freebloks 3D for Android (c) by Sascha Hlusiak, 2012-2019. Freebloks 3D is free software. You can use and modify it completely free of charge, according to the GPLv2. But that does not mean it has no value. If you like Freebloks 3D, please consider to support the developers by buying Freebloks VIP from Google Play or via PayPal.